Coming June 1, the LEGO Minecraft Village is a $199 box containing 1,600 pieces used to create something an 11-year-old could create on their computer in an hour. Plus it comes with an enderman, which is somehow scarier in LEGO form. Look at this beautiful box filled with fabulous prizes. It’s the sort of box LEGO reps who tell me to feel free to ask for anything I’d like to review for Toy Time say “Oh, not that one” about. 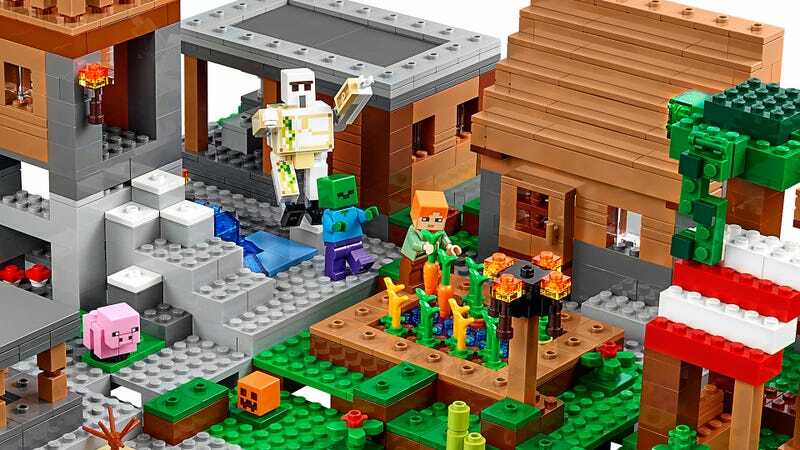 As the rep who gave me a tour during Toy Fair this year said, Minecraft is currently LEGO’s best-selling licensed property, so it’s about time they put that best-sellingness to the test with a truly pricey playset. Arranged in the recommended configuration, The Village measures 5 inches tall, 17 inches wide and 19 inches deep. If I am doing my math correctly here I wouldn’t know, but it takes up a significant amount of desk space I imagine. You want mining? It’s got mining. Want to hold an open house and invite your friends over? Oh, and these are the people in your neighborhood. Just your normal, everyday villagers. Nothing to see here. The Village is an expansive (and expensive) set, packed with squares taking the place of things that are normally squares in the first place. I really do love the look of these sets. I’ve been itching to buy more LEGO Minecraft since I put together the First Night set last year. The only thing holding me back, and this might sound silly, is I haven’t played enough Minecraft the game to feel entitled to buying more Minecraft the LEGO sets. That and I am seriously running out of room. Best to get it out of my system in one village-sized building marathon come June 1.